Home › Indian Gems › Attenborough’s Gandhi with my 5 year old. Attenborough’s Gandhi with my 5 year old. 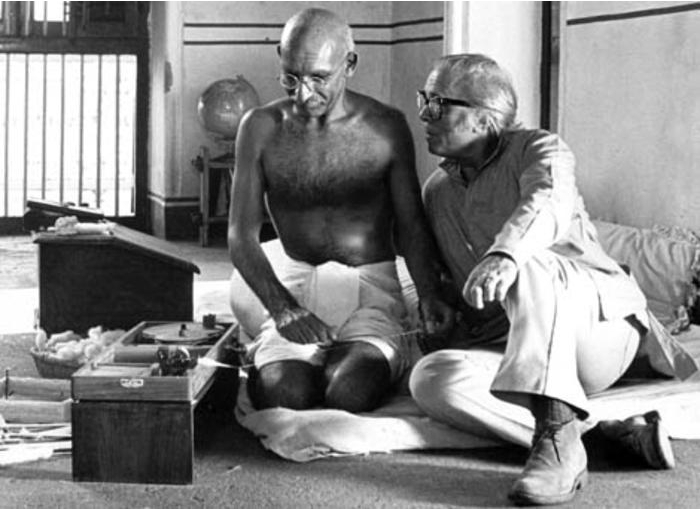 This conversation was the result of watching Richard Attenborough’s Gandhi several times with my daughter, I believe nearly 10 times, as I lay in bed with a bad back ache. I was trying to wriggle out of watching Cartoon Network, which was my fate as I was the baby sitter, not the easiest job to do bedridden. At first it was just an experiment -subjecting a 5 year old to a film like Gandhi with mature themes may not be the wisest thing to do, but when I recalled the age at which I might have seen it I gave it a go. To my utter surprise the film held her attention completely and her attention span is nothing to write home about, except when in front of a glowing rectangle showing animated content. Much has been written about the power of film to influence and sometimes damage impressionistic young minds, which I was acutely aware of. We watched the film on totally different planes – for her it was more about grappling with the basic concepts of what is a country ,what is the meaning of violence and what did Gandhi mean when he said, “An eye for an eye makes the whole world blind”. For me it was immersing myself in one of the greatest, and sadly forgotten films ever made. The irony of the films ignonymous fate after sweeping the Oscars is the same as that of Gandhi the man himself- after capturing an entire generation’s attention fully, being ignored in favour of new ideas that are easier to digest in today’s here and now Twitter world. I remember watching the film when it was released along with my extended joint family of about 20 heads at about the same age as my daughter. I vividly recall the assassination scene, an event which I recently heard a news anchor refer to as “murder”(as opposed to the appropriate word “assassination”) and how Attenborough used it again at the end to great effect. It is the only film we saw as an extended family- it must have been a terribly important film for Indians, partly due to the sheer novelty of it having been made by a foreigner and British man at that. Since then we still haven’t been able to make a decent political film, for example a film about India’s most controversial Prime Minister India Gandhi cries out to be made, but that’s another story. Thereafter the film became a independence day ritual on Doordarshan and I watched spellbound. This must have continued for 10 years and then I lost touch. I acquired a DVD copy many years later but only lent it around to my foreign friends and noted with pride their sense of wonder and awe at the story of India’s independence. So what makes Gandhi such a great film? Consider for example a scene at the end of the film where Gandhi, incarcerated in a former palace converted into a makeshift prison, is sitting in the garden and spinning cotton.Margaret Bourke White the celebrated Life magazine photographer, played by the stunningly beautiful Candice Bergen, watches with growing exasperation. She tries her hand at spinning and failing to produce a centimeter of thread, exclaims in frustration, “I fail to see this (spinning cotton) as a solution to the world’s problems”. She is referring of course to the scourge of WW2 which the world is facing and the matter of India’s independence appears trivial in comparison. She asks Gandhi a pointed question about Hitler and if nonviolence will work on him. Gandhi replies, “Not without defeats and sacrifices, but are there no sacrifices and defeats in this war?” His reply is in two parts- his shrug which implies his admission that he has not fully though through this, and his words which convey his absolute belief in a philosophy that he has spent a lifetime testing and fine tuning (he called his autobiography simply “My Experiments with Truth”).Note also his deft handling of media in those early days to his advantage, told as a side story about his enduring friendship with a NY Times reporter.Ben Kinsley speaks of one scene with Martin Sheen filmed in Gujrat against the backdrop of a setting sun on the Arabian Sea where Gandhi and Charlie discuss the Dandi March which he is about to embark upon, as a moment which he cherishes and which became a sublime piece of cinema. There is an amusing scene involving Sardar Patel and Gandhi upon his arrival back to India from South Africa. Patel patronises Gandhi by telling him that he is no longer a bumbling junior lawyer in Bombay High Court and may address him by first name. When asked about Nehru who Gandhi had met just briefly at the docks, Patel replies that Nehru is a youngster with the charm of the devil, the good looks of his mother and the intellect of his father. “He May amount to something”, is Patel’s slightly condescending verdict on his future boss. The power of this film lies not in the performances, towering as they are, especially Ben Kinsley as Gandhi who digs very deep indeed, but in the brilliant and inspired screenplay.The story of this film being a work in progress is as much a story of its screenplay which had an equally checkered history. Screenwriter John Briley makes the subject his own and embellishes it with great detail and tells an impossibly long story with considerable economy, wit and charm.All biopics need to be “inspired” in the first place to ever get made.The other meaning of inspired is the licence to take liberty with fact which is not always a bad thing.Consider for example the fact that Gandhi was not actually thrown off the train at Peitermaritzburg but Attenborough and Briley amplified the incident prudently, because there was so much insult he could not show because he was making only a three hour long film and not a 30 hour long film which is required to chronicle that colossal life. The making of Gandhi has of course passed into folklore and Attenborough devoted his whole life to mounting this magnificent production, nearly bankrupting himself in the process and selling a stake in the iconic play “Mousetrap” to finance his magnum opus. The film enjoyed the wholehearted support of Nehru, during whose time it was conceptualised, and Indira Gandhi who facilitated the actual filming.I cannot imagine a film like this being made in todays fractured political environment without being subjected to umpteen narrow minded hurdles. The story of Gandhi is the story of India’s freedom struggle itself, of the choices that our ancestors made as a people, the birth and maturing of a philosophy which continues to inspire world leaders even today. Above all Gandhi is the story of an individual who never shied away from his convictions and embraced the mistakes he made along the way. The film offers a well-rounded look at this enormous life. Gandhi never won the Nobel peace prize but the film won Oscar beating Spielberg’s E.T. in the process, a film Attenborough concedes to be better than his, in terms of it’s pure cinematic power. A film even as magnificent as Gandhi can never be the only introduction to the Father of the Nation but in the absence of anything better it’s all we have to show our children. It’s the perfect combination of a compelling story told by the most compelling storytelling medium at the disposal of mankind – cinema.And we Indians owe a big debt to its maker Richard Attenborough. A film director as a true Gandhian! #I met Ben Kingsley once at a film festival in Holland where he was being honoured with a Lifetime achievement award.I asked him which part of Gandhi’s life would be see like to be made into a another film, since his life was so rich.He replied, ” Any part, and a few have indeed been done”.This was a very wise response to the question and he turned around and complimented me on asking a very thought provoking question.I cherish that moment! I may have seen ‘Gandhi’ umpteen times while growing up but after reading this I am going to watch the movie with my son. A gentle reminder to those who think Bhaag Milkha Bhaag is a great biopic, what a great biopic can be like.Gandhi is the greatest biopic ever made, in my considered opinion. Though Gandhi is a landmark movie in itself, it doesn’t directly inspire the viewer to get up , stand up and start striving for oneself like BMB. I think that’s where the difference lies. We can watch Gandhi, Gokhle, Sardar, Legend of Bhagat Singh and feel awe and proud and amazed at what heights one guy can lead a country to. But, BMB inspires from within to take a re-look at your life. Start running if you are shunning gym, start respecting life you have been bestowed with, to make the most of what life has to offer. We want to be inspired from a common person who had nothing to make it big. Well Gandhi inspired me profoundly as did all the literature I read about him..BMB would have but for the fact that 90 minutes of good footage was ruined by 90 minutes of crap..Milkha Singh is an icon and deserved a better biopic.I am so looking forward to his biography .so great to hear that BMB inspired you, I certainly hope that it makes India a fitter nation!